The Benevolent Street Zendo is an ongoing meditation group offering meditation the Zen tradition, Dharma talks, and opportunities for spiritual direction. The sangha meets most Mondays. It is jointly presented as an activity of our congregation and Boundless Way Zen. If you are new, we encourage you to attend an introductory instruction at 6:45. Practice leaders are Cindy Bapties and George Beshers. Our resident teacher is James Myosen Cordova, Sensei. Join our drop-in group for guided meditations of wisdom, love, and sustainable compassion. These practices are adapted from Tibetan Buddhism into new forms that can touch the hearts and minds of people from all backgrounds and faiths. This group helps each of us to bring out the best in ourselves within our relationships and in our service to others. No previous meditation experience is required. Before attending, it would be helpful to visit our website and listen to the practice on identifying and communing with benefactors: http://foundationforactivecompassion.org/audios-videos-texts. Chalice Circles, a Small Group Ministry program, fulfills the need for intimacy and spiritual growth within our larger faith community. Small groups of eight to ten people meet in each other’s homes or at the church to enhance connections and provide an avenue for religious growth and spiritual meaning. Click here to learn more about Small Group Ministry and First Unitarian’s Chalice Circles. The Peace Flag Project provides an opportunity to create flags about our deepest hopes for the world. Based on the Tibetan Prayer Flag tradition, these flags send out prayers for peace, harmony, and compassion. Our major event is the Peace Fest which expands our celebration of the UN Peace Day and unites peacemakers all over Rhode Island. 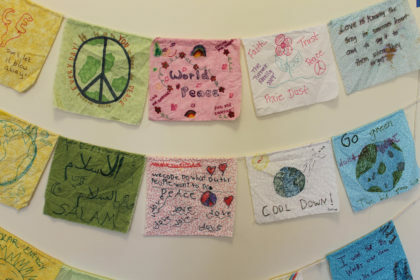 First Unitarian hosts a peace art exhibit as part of the Month of Peace. Children and youth participate by making peace flags that hang in the auditorium.